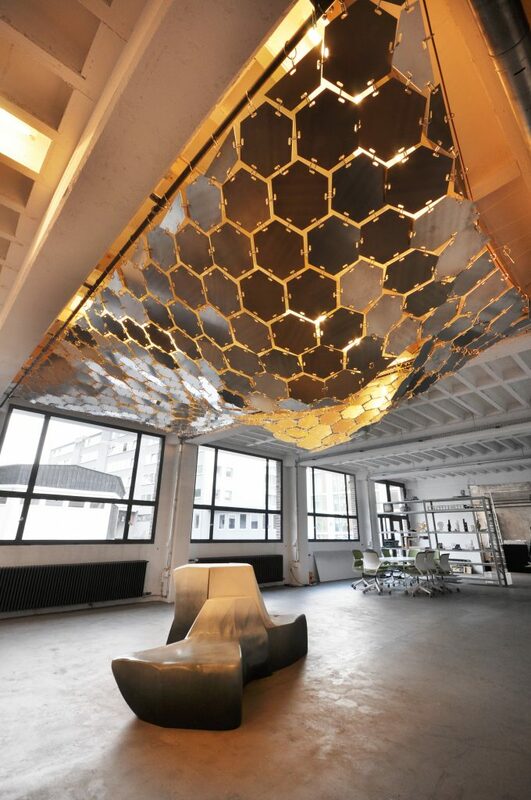 LAVA realised a kinetic sound trap that can improve acoustic performance of a space by varying the amount of exposed absorbent and reflective surfaces. The Laboratory for Visionary Architecture (LAVA) has, together with their engineering partner Bollinger & Grohmann, developed a ceiling that can change the acoustic performance of space according to various functional needs. The project has been installed inside the multi-functional ground floor of LAVA’s Stuttgart office. The space is designed to be as open as possible so it can host lectures, meetings, parties, and various other functions. In addition, the office kitchen and model shop are also located in the same undivided space. These different uses of the space are sometimes in conflict when it comes to sound production. The relatively long space with its large concrete surfaces cause longer reverberation times, which decrease the audibility of sound and speech within the open floor plan. In other situations problems occur when multiple people are using the space for various functions, such as having a telephone conference on one end while others are using the kitchen on the opposite end. Different usages need different acoustic qualities. Absorption alone would be not sufficient. In some scenarios, such as hosting a lecture or speaking event, shortening the reverberation time by using reflective surfaces with controlled angles can improve the audibility of the speaker for the audience. 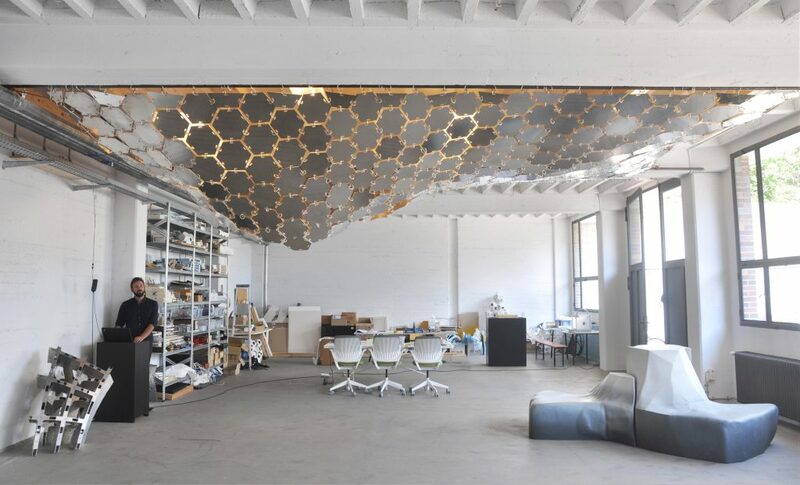 The design solution in this case was a hanging ceiling of hexagonal aluminum panels with joints that enable freedom of movement. “The whole ceiling behaves like cloth; by pulling on a limited amount of points we can make large deformations of the surface. These points are lifted by a system of wires that can be pulled by a total of six servos. We deliberately wanted to keep the amount of servos as low as possible and by doing so create a kinetic system that is easy to control and maintain.” Matthijs la Roi, project architect at LAVA explains. Absorbent material is placed above the metal panels and can be exposed by opening a large cut in the middle of the ceiling. When opened, sound waves that enter get trapped and are slowly absorbed through bouncing within the ceiling. When more reflection is required, the ceiling can close. Acoustic specialists from Bollinger+Grohmann proved the ‘sound trap’ concept through the use of acoustic simulation software. 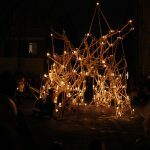 During a one week workshop organized by LAVA-AXON, a recent initiative by LAVA, students and professionals developed various designs proposals, of which one was realized and built within the same week. The project is a continuation of a previous design study for a 2400m2 kinetic ceiling that LAVA has developed in collaboration with Bollinger & Grohmann. 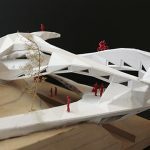 The project opens a range of possibilities where kinetic architecture can improve qualities of multi-functional spaces. By collaborating with acoustic specialists and structural engineers in an early stage, the beauty of the solution is that the form is an outcome of functional and structural requirements resulting in an elegantly curved geometry.